While lasers still seem like science fiction, they’ve been used commercially (and medically) for decades. But there’s still room for growth in practical applications with this developing technology. One promising area is in the treatment of periodontal (gum) disease. Gum disease is a bacterial infection triggered by plaque, a thin film of bacteria and food particles caused by inadequate oral hygiene. The disease is highly destructive and can eventually lead to both tooth and bone loss. Treatment procedures vary widely, but they all have the same goal: remove the offending plaque and calculus (tartar) from tooth and gum surfaces. Without plaque the infection subsides and the gums can heal. For decades now, dentists have removed plaque and calculus manually with special hand instruments or ultrasonic equipment. If the disease has advanced below the gum line or formed deep voids filled with infection called periodontal pockets, the dentist may also employ surgical techniques to access the infected areas. While all these techniques have a long track record for effectiveness, they can cause the inadvertent destruction of healthy tissue, as well as create discomfort for some patients afterward. This is where a new protocol called Laser Assisted New Attachment Procedure (LANAP®) may be able to make a difference in the future. With the LANAP® protocol, surgeons direct a laser beam of light through a fiber optic the width of three human hairs onto diseased tissue. The particular color of light interacts with the tissue, which contains the darkly-pigmented bacteria causing the disease, and “vaporizes” it. The beam, however, passes harmlessly through lighter-pigmented healthy tissue; as a result diseased tissue is eradicated with little to no harm to adjacent healthy tissue. With these capabilities, trained dentists using LANAP® for gum disease treatment might be able to achieve conventional results with less tissue removal and bleeding, less discomfort for patients, and less tissue shrinkage than traditional procedures — and without scalpels or sutures. And some post-surgical studies have indicated LANAP® might also encourage gum tissue regeneration in the months following. LANAP®, however, is still developing and requires further research. Thus far, though, the results have been encouraging. 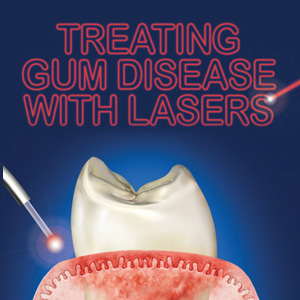 As laser technology advances, it’s quite possible tomorrow’s patient may experience less discomfort and more effective healing with their gum disease treatment. Dr. Travis Stork: If Only I'd Worn A Mouthguard!